A short residency in Stuttgart in April 2018, invited by Yellow Door Artists has resulted in an exhibition opening this weekend at the Rathaus in Stuttgart to celebrate the 70th anniversary of St Helens and Stuttgart’s town twinning. I’ll be showing two pairs of photographs from the performances of What are you waiting for? that took place outside Bibliothek in Stuttgart in April and from Thatto Heath Library in St Helens in October. 19th November – 14th December 2018. An invitation to the opening of our twin town exhibition on Friday 16th November 2018 at 6pm, Rathaus Stuttgart, 4th floor, Marktplatz 1, 70173. Welcome speech by Nadia Vom Schiedt: Director of the Department of International Relations, followed by an introduction talk by Vivien Sigmund: Art Historian MA. This exhibition takes place in the context of the 70 year partnership between Stuttgart and St Helens and the 30 year partnership with Lodz. It showcases 4 artists from St Helens, 1 from Lodz and 4 Stuttgart artists, who have all undertaken artist exchanges between the towns. Opening Times: Monday to Friday 10am – 6pm, Free Entry. Duration of Exhibition: 19 November until 14 December. This autumn the three editions of Aridane’s thread will be joining a host other artist-book makers from around the world in three exhibitions. 21 September – 1 October 2018. Established in 2012 in the Tokyo/Yokohama area, Art Byte Critique responds to a desire for a community of artists interested in sharing ideas and feedback about their studio process. Since 2014, Art Byte Critique artists have been exploring various modes of expression through artists’ books and zines. At the same time, Art Byte Critique established a connection with artists in St. Helens, England through artist Joan Birkett with the intent to develop relationships and collaborations. This connection has happily borne fruit in 2018. Art Byte Critique artists and St. Helens artists organized a collaborative exhibition of artists’ books and zines at the Eccleston Community Library in St. Helens and the World of Glass in St. Helens this past spring. These works will tour to Paper Gallery in Manchester under the title “Turning the Page” from September 29 – November 3, 2018. 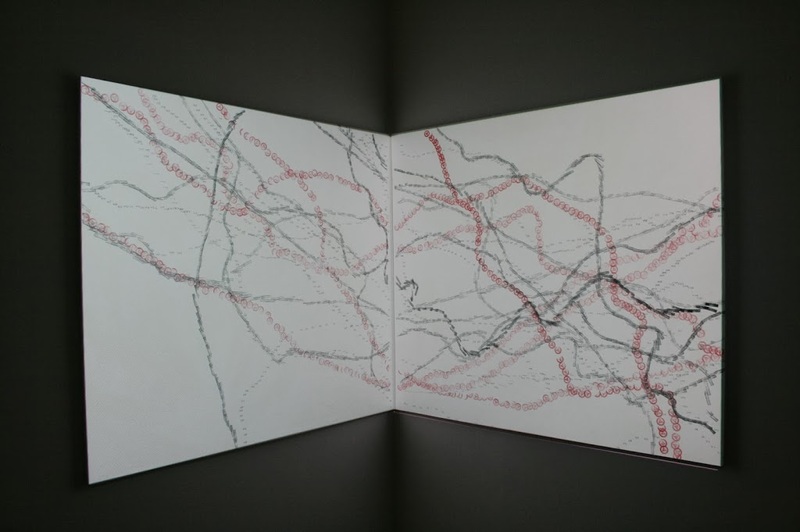 “Reading Between the Lines” at Launch Pad Gallery in Yokohama is the first collaborative artists’ books and zines exhibition for Art Byte Critique and the St. Helens artists in Japan. This exhibition will feature recent works and new works created by a number of artists for this exhibition. In the spirit of bookmaking and collaboration, “Reading Between the Lines” will be hosting a series of workshops and events by the artists. We want to give visitors a chance to learn more about bookmaking and try their hand at bookmaking. My work ‘What are you waiting for’ will be exhibited again from February at Ordsall Hall in Salford as part of the next iteration of Markmakers’ exhibition ‘Interval’. Exhibition continues to 13 May 2018. Is it just blank space? Is there anything of interest in the gaps? As a group of artists, ‘Markmakers’ come together to explore common themes through each artist’s individual contemporary art practice. Over the past year their theme has been interval. What is an interval? Is it just a blank space? Is there anything of interest in the gaps? The exhibition will include new work directly inspired by Ordsall Hall with some interventions in other areas of the Hall. Have a break, visit interval. Car Parking: Please note that car park charges apply during the Hall’s opening hours (Monday – Thursday 10am – 4pm and Sunday 1 – 4pm). Costs are £2 for up to 3 hours and £6 for over 3 hours. Tram:The Hall is very close to the Exchange Quay Metrolink Station on the MediaCity UK / Eccles line. Bus:Any bus to Salford Quays on the A5063 stops on Trafford Road (the Copthorne Hotel) leaving a short walk to the Hall. This year I’ve been making a lot (for me) of print work, exploring monoprinting and adding in a little bit of screenprint for variety. I’ve participated in the Hot Bed Press 20:20 print exchange, which saw a flurry of print activity and furrowed brows at Platform studios in St Helens as 9 other artists joined together to create a series of 25 prints at 20cm square. To celebrate this joint enterprise, we’re having a festive celebration at Platform studios on Saturday 9th December from 1-4pm. You’ll be able to view the works produced for the exchange, see the works we’ve received from other printmakers across the UK, eat cake that has been baked to fit the 20x20cm guidelines and enjoy a warming hot chocolate. I’ll have a selection of prints for sale, some are especially festive and others are things I’ve worked on during this year. There will be prices from £2 to £10, and all of the proceeds from these sales will be ploughed into producing a new programme of work planned for 2018 that works directly with people who have been displaced from their home countries. Available prints and prices are in the gallery below, if you see something you like but can’t make it on the 9th, then get in touch and I can post it out to you for the price of a first class stamp (an extra 75p). My new work, What are you waiting for? features in the latest exhibition by artist collective Markmakers, which opens at The Brindley Arts Centre, Runcorn on 2 October 2017. This set of six custom-made belts feature retractable crowd control barriers, designed to be worn by performers in a public space, creating moveable spaces for waiting as the wearers move around a street. The first experimental iteration of this intervention will take place in Runcorn on Monday 9th October 2017 and if you’d like to join in or come and observe, then get in touch via my contact page. The work is part of the exhibition Interval, by Markmakers. The latest exhibition by Markmakers invites you take an interval. Step inside the punctuated, whitewashed walls of the gallery and consider self imposed breaks in life. Explore concepts of time. Sit, stand, look or listen. FREE. Mon – Fri 10am – 5pm, Sat 10am – 2pm. Closed Sundays & Bank Holidays. And a set of three drawings that are part of the ‘Drawing the Collection’ exhibition, also at The World of Glass. They are based on observations in the hot glass studio of The World of Glass, observing how the ellipses of glass morph and change in the process of hand blowing different vessels. ‘Drawing the Collection’ is on show at The World of Glass until Friday 3rd November 2017. 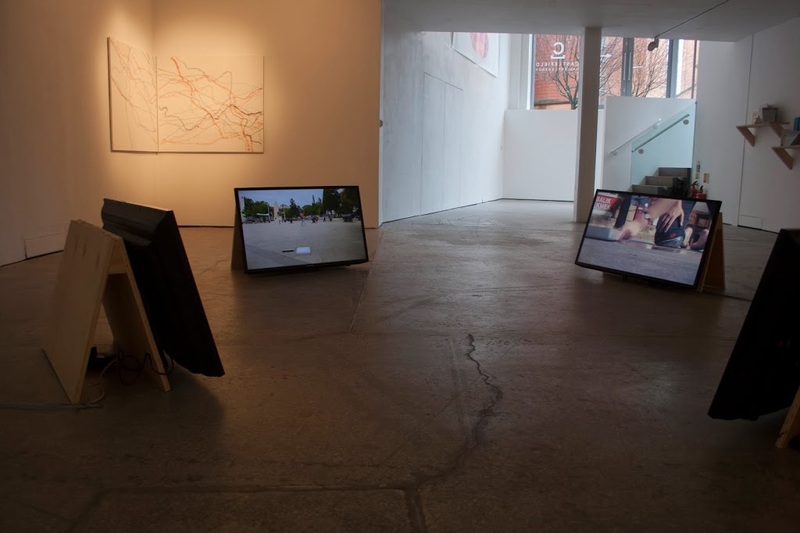 The Cornerstone Gallery at Hope University in Liverpool celebrates it’s ten year anniversary this summer with an exhibition of artists who have exhibited there in the previous decade. I’ll be showing one of my pinned collages created in Shanghai in 2012. The show will be open during the Liverpool Independents Biennial, 9am-5pm weekdays only. My solo exhibition ‘A landscape of marginal encounters’ opens from Saturday 28 June 2014 at The Brindley Arts Centre in Runcorn. 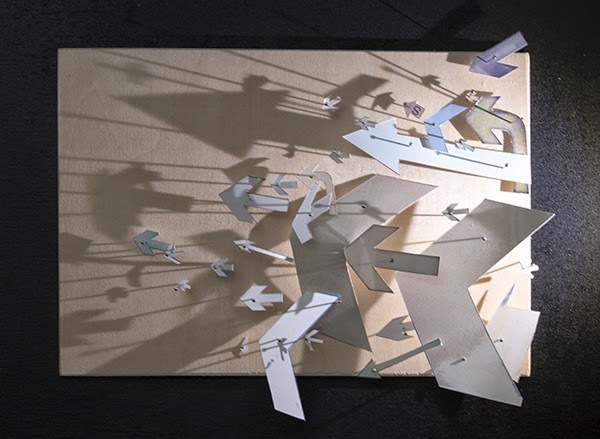 From the draw o expansive spaces in big cities to encounters in more intimate spaces, this exhibition will feature new installations and artworks which explore how people move through spaces and what factors affect that movement. 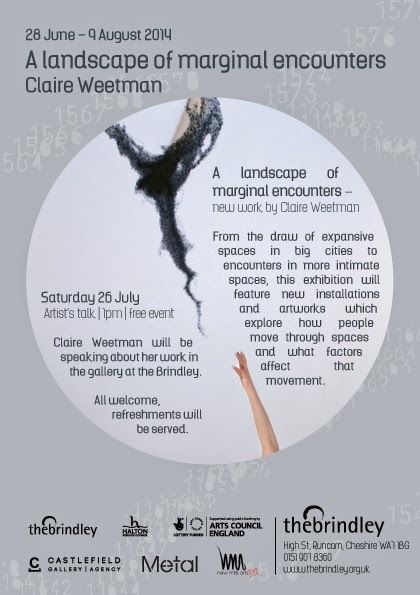 Claire Weetman will be speaking about her work in the gallery at the Brindley. Supported by Arts Council England Grants for the Arts, Halton Borough Council Arts Development Team, Castlefield Gallery New Art Spaces, Metal Time and Space residency, New Mills Arts Festival. Last Thursday night saw the opening of this exhibition, which continues from today until Sunday 23 February, so you’ll need to be quick if you want to see it. I’ve got Watermark installed as a four channel video installation and I created Migrate: Free Movement of Workers, a drawing using rubber stamps and a projection live on Thursday night at the opening event. 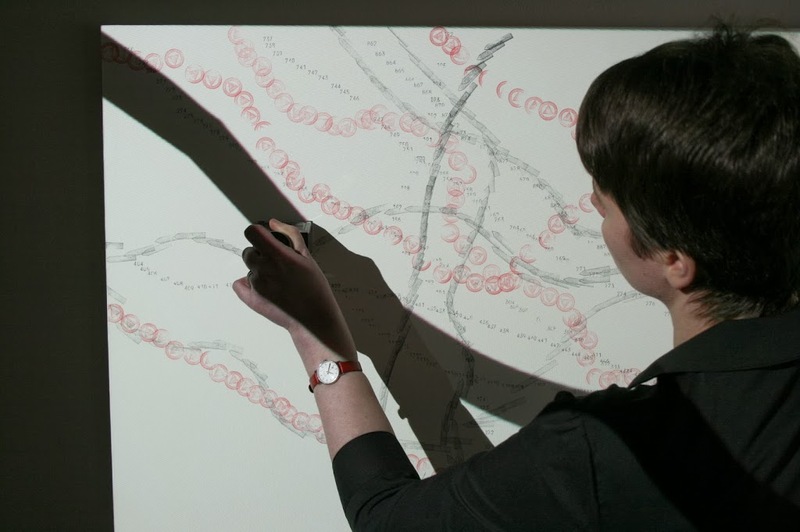 Take a look at my website for more pictures from the performance and don’t forget that you can download the Drawing Project publication, which includes two essays on drawing by Sophie Preston and Lewis Cornish from the website.